The mindLightz system by MindGear, Inc., is the first to employ Bluetooth technology for light and sound brainwave stimulation. The mindLightz software is a free app available in iTunes that features easy to navigate selections including 83 built-in light and sound programs, manual control mode for designing your own personal light and sound programs and Colormatrix light frames with over 500 different colors. THE WORLD’s FIRST AND ONLY WIRELESS MIND MACHINE! The bluetooth mindLightz mind machine is wireless light and sound that operates via Bluetooth Colormatrix lightframes (offering over 500 different shades of color), Bluetooth headphones (no crackle, just pure audio) and your iPhone 4S, iPad3, iPod5 or any newer iPhone/iPad running iOS 6.1+. EXCLUSIVE BONUS SET OF OUR MOST POPULAR AUDIO MP3 DOWNLOADS VALUED OVER $100.00… scroll down for complete information! The mindLightz system by MindGear, Inc., is the first to employ Bluetooth technology for light and sound brainwave stimulation. For those of us who own an Apple product listed above, the mindLightz software is a free app available in iTunes that features easy to navigate selections including 83 built-in light and sound programs and manual control mode for designing your own personal light and sound programs. In addition, the user has full independent volume control for selecting 25 various ambient sound effects with any audio track from your iTunes library. No longer do you need a mind machine to enjoy experiencing the relaxing benefits of pulsed visual and audio brainwave stimulation. 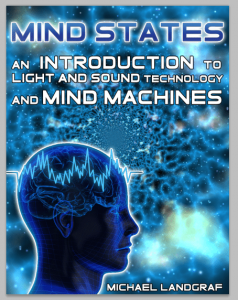 Download the free bluetooth mindLightz app to view the owners manual, list of programs (including all four general brainwave states, combinations and programs specific to ADD/ADHD and PTSD) and the assortment of ambient sound effects (even including heart rate beats-per-minute selections). The bluetooth mindLightz light and sound system available through Mindmachines.com comes complete with MindGear’s Colormatrix bluetooth light frames and headphones with free shipping to the entire United States.